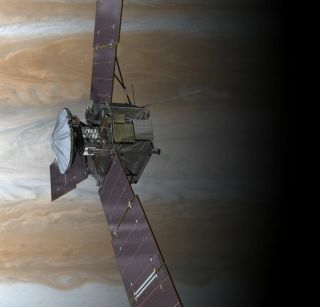 All systems are go again for a NASA probe on its way to Jupiter. NASA's Juno spacecraft exited a protective "safe mode" on Friday afternoon (Oct. 11) and is currently operating normally as it streaks toward a July 2016 rendezvous with the solar system's largest planet, mission officials said. Juno went into safe mode on Wednesday (Oct. 9), just 10 minutes after zooming within 347 miles (558 kilometers) of Earth during a flyby designed to boost the spacecraft's speed from 78,000 mph to 87,000 mph (126,000 to 140,000 km/h). NASA's Juno spacecraft to study Jupiter like never before. See how NASA's latest Jupiter probe works. Spacecraft enter safe mode when they encounter an unexpected or anomalous condition. In this case, Juno turned off its instruments and some non-critical components, then pointed its huge solar arrays toward the sun to ensure a steady stream of power, officials said. Juno team members had expressed confidence that the probe would recover fully from the still-mysterious glitch, and their optimism was borne out, as Juno has now resumed full flight operations. Further, the main goal of the flyby was accomplished, putting Juno on the correct trajectory to Jupiter, officials said. The spacecraft is so heavy — about 8,000 pounds, or 3,267 kilograms — that it needed a gravity assist from Earth after its August 2011 launch. Mission team members also checked out Juno's science equipment and took photos of the Earth-moon system during the flyby. Scientists are still analyzing these data and images, most of which were returned to Earth before Juno went into safe mode. When Juno arrives in orbit around Jupiter, it will study the gas giant's atmosphere, gravitational field and magnetic field with its nine science instruments over the course of a full Earth year. Researchers hope the probe's observations reveal insights about the planet's formation, structure and composition, including whether or not it possesses a solid core. The $1.1 billion Juno mission is named after a goddess in Greek and Roman mythology. In the myth, the god Jupiter (or Zeus, in the Greek version) used clouds to hide his mischief, but his wife Juno was able to peer through the veil to see her husband's antics, according to a NASA description.